Google Translate is now available for iPad, iPhone, iPod Touch and Android mobile devices and could well be the app that saves your bacon when you don’t know the local lingo, or help you order it in far flung places! It is a well known online translation service provided for FREE by Google, bought to mobile devices with a few more exciting features. 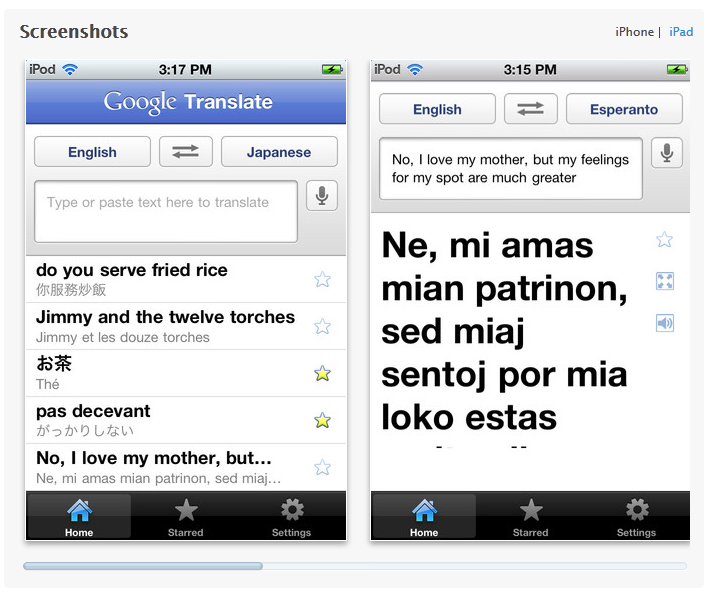 Choose from one of 65 languages, type in your word or sentence and hit translate! Your query is then returned in text form to try and say or to show to the person you want to understand you! The wonders of modern technology mean that you can also perform speech to text, text to speech and even speech to speech translations with this app. However, only 17 languages support the speech function so far. Also, if your phone has a camera, you can take a picture and brush the text to translate! Very clever stuff indeed, especially for translating signs and menus. Google translate has been well known for being a bit off the mark when it comes to accuracy, but the general consensus is that for individual words and simple sentences it does just fine. It is also perfect for helping out in tricky situations where getting your point across at all would be otherwise impossible. Check out the ratings from Google Play and iTunes below, or try the Google Translate App out for yourself. This entry was posted in Uncategorized on January 31, 2013 by worldwideinsure.